W.S.B. Grimson by 1930. (M. Knoedler & Co.), London; probably purchased from (M. Knoedler & Co.), New York, by Mrs. Henry C. Lancashire; by descent to her daughter, Mrs. Richard Southgate, Manchester, Massachusetts; gift to NGA, 1951. A letter to Grimson about the picture, from the then Warden of Merton, in NGA curatorial files, is dated 20 March 1930. Loan for display with permanent collection, Norfolk Museum of Arts and Sciences (now Chrysler Museum), Virginia, 1967-1972. The medium-fine canvas is plain woven; it has been lined. The ground is light gray, thinly and smoothly applied. The painting is broadly executed in fairly thin, smooth, opaque layers with only slight impasto in the highlights; the brown shadows and thin green paint of the background have a glazelike quality. The light-colored area to the left of the right arm may represent a pentimento, but the x-radiographs do not reveal an underpainted design. The painting is in good condition with only a few minor losses, chiefly in the sky. The natural resin varnish, evenly applied when the picture was surface cleaned in 1951, has not discolored. Summary Catalogue of European Paintings and Sculpture. National Gallery of Art, Washington, 1965: 67, as Joseph Highmore, A Scholar of Merton College, Oxford. European Paintings and Sculpture, Illustrations. National Gallery of Art, Washington, 1968: 59, repro., as Joseph Highmore, A Scholar of Merton College, Oxford. European Paintings: An Illustrated Summary Catalogue. 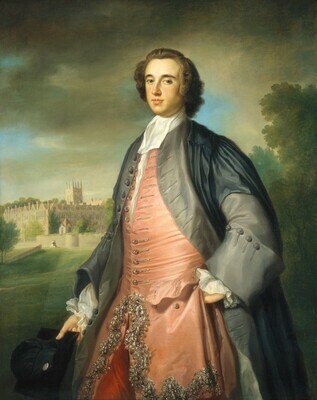 National Gallery of Art, Washington, 1975: 174, repro., as Joseph Highmore, A Scholar of Merton College, Oxford. Lewis, Alison Shepherd. "Joseph Highmore: 1692-1780." Ph.D. dissertation, Harvard University, Cambridge, Massachusetts, 1975. Ann Arbor, Michigan, 1979: 638. Hayes, John. British Paintings of the Sixteenth through Nineteenth Centuries. The Collections of the National Gallery of Art Systematic Catalogue. Washington, D.C., 1992: 150-152, color repro. 151.